Mars 3D - Virtual Red Planet is a complete three dimensional VRML globe model of planet Mars. 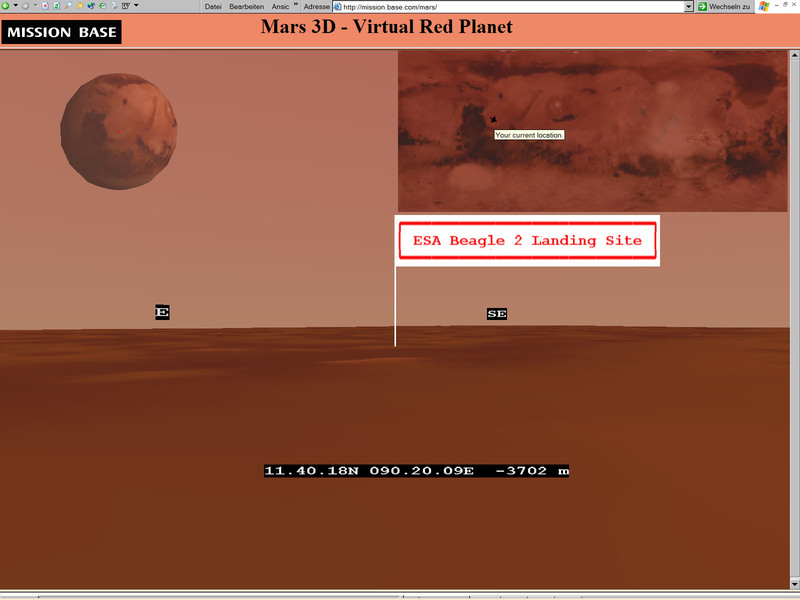 The input for the VRML 3D Mars model is taken from the 1/128 MOLA data set published by NASA. The 1/128 MOLA dataset is a digital elevation model (DEM) of planet Mars with a horizontal grid spacing of approximately 28 arc seconds (less than 1 kilometer / about a quarter mile). 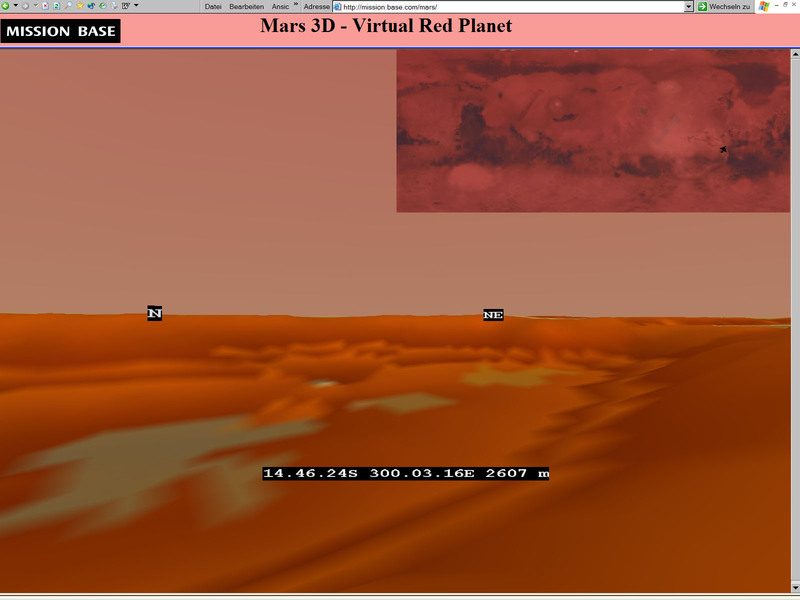 Mars 3D - Virtual Red Planet also displays planetary feature location information of about 1500 places derived from the USGS Mars Nomenclature dataset. This dataset is provided here with a searchable index, you can search for any planetary feature mentioned in the USGS Mars Nomenclature dataset. Mars 3D - Virtual Red Planet consists of a 3D virtual model of the entire planet Mars of about 1 000 million VRML polygons that get seamlessly downloaded while you browse the model. 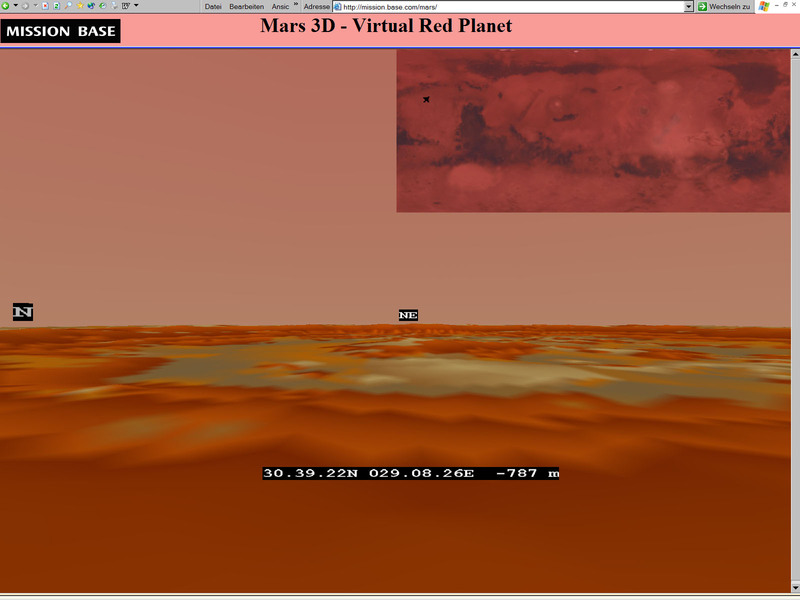 Mars 3D - Virtual Red Planet can be viewed with a VRML browser like blaxxun Contact that can be downloaded from blaxxun interactive. This program runs only on WINDOWS computers that have a graphics card with at least 16 MB of video memory. A setup with WINDOWS XP and with DirectX 8 and at least a 32 MB AGP video card is prefered. Other VRML Viewers like Parallel Graphics' Cortona or SGI's Cosmo Player should also work. Please let me know if you experience problems with any of those players. Select a place on Mars where you want to start: A random place on Mars. The NASA Rover "Spirit" Landing Site: GUSEV CRATER, latitude 14 36 S, longitude 175 24 E.
Tip: Search for "site" to see a list of all landing sites of missions to Mars or search for "mons" to see all mountains listed in the dataset or "vall" to see all valleys. 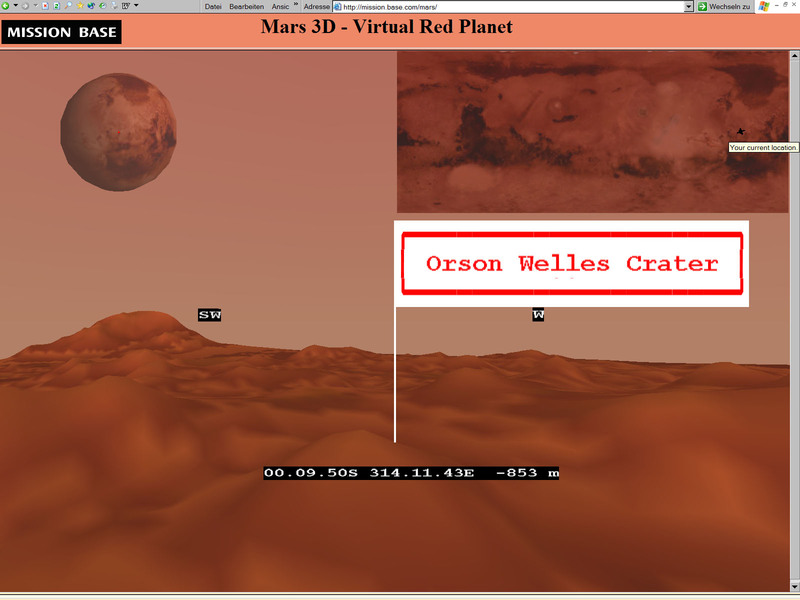 Enter Mars 3D - Virtual Red Planet as a blaxxun multi-user world, this requires blaxxun Contact. The music played is the piece "Mars needs a theme song" from the Martian Music Series by Robert G Stein. This original piece of music was specially composed for the project Mars 3D - Virtual Red Planet by Robert G Stein. Note: For performance reasons I took the music out from Mars 3D - Virtual Red Planet, you can listen to it if you have a powerfull machine and click on the Mars 3D with music link. I have a similar digital elevation model which I want to visualize, would that work? Well, if you can access your dataset from a cgi script and can write a cgi script that outputs the elevation data of a certain tile of your data if asked for a specific latitude and longitude, we can talk about it. E.g. the cgi request url mars?TPL=mars/tilemars&LAT=480000N&LON=0120000E fetches the data of one tile located at 48 North, 12 degrees East. Seriously, I did this project for fun and I enjoyed it very much, so if you have a data set that promises to show something new I am more than happy to collaborate. What perspective and projection are you using? The elevation data is taken from MOLA. This data is only cached for processing, no further calculations are done. How does the seamless browsing work? When you enter the model the main world with the HUD, the map, etc. gets loaded. This world inlines 9 sub tiles. The sub tiles are arranged in a square so that the user position is on the middle one of the 9 tiles. If you move off of the middle tile, the 3 tiles that are now far behind you are moved in front of you and new geometry gets loaded into those 3 tiles. If you move too fast or your internet connection is too slow you will notice that the tiles are not loaded underneath or in front of you. Stop moving and wait a little while in this case. What is the little red spot on the globe? The marker shows your current position on the globe, it moves over the globe while you move around. Why is the search label displayed? All name flags of planetary feature names are anchors that start a search on Google with the feature name as query string. The coloring is entirely mine. I find out whether a given point is on a hill, on a slope or in a valley and use different colors for these three cases. Are the altitude readings on the HUD correct? Yes, while you move around the HUD continously displays your current position in degrees and your altitude in meters. Can you say more about the inner workings of the program? The program reads a 64 by 64 elevation point square with the given location at the upper left corner from the MOLA data. Last the program prints a VRML template and fills the heights and color values into an ElevationGrid with colorPerVertex color. The resulting VRML file gets gzip'ed on the fly and then sent on its way to your browser. In order to display the entire scene the program gets called with a request to print the main world first. /cgi-bin/mars?TPL=mars/mars&LAT=480000N&LON=0120000E. This uses a different VRML template for the main world. The main world VRML in turn calles the program 9 times to print the 9 subtiles. The main world VRML also contains the code that loads the tiles needed while you walk around. This code is written in VRML script. The Nasa site linking to this page, NASA Marsoweb links page. 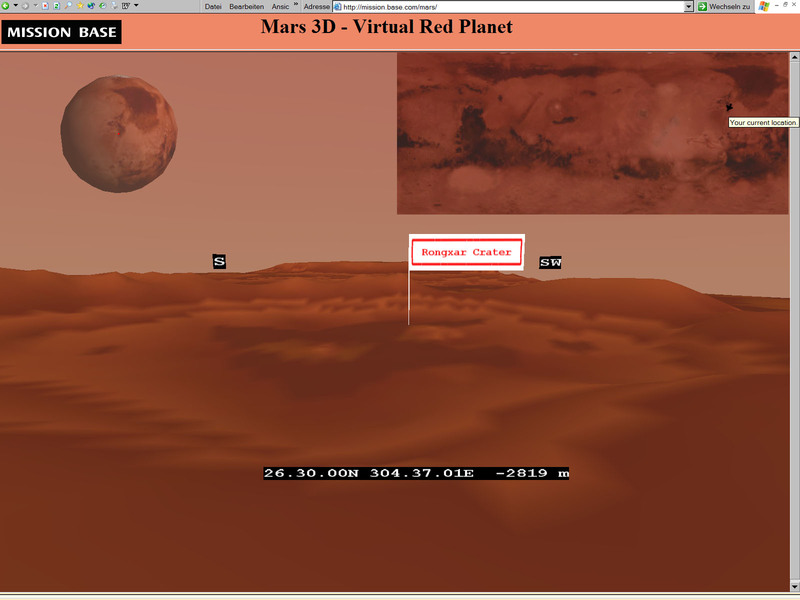 Mars 3D - Virtual Red Planet has been selected by WEB3DART 2004, category scientific models. Thank you to NASA for making the MOLA data set available on the net. Thank you to USGS for making the Mars Nomenclature dataset available on the net. Thanks to the web 3D consortium for providing the mailing list and the GeoVRML working group. Thanks to SPACE-GRAPHICS for providing the map image used on the Mars globe. Thank you to Google for their wonderful search engine. Special thanks to Holger Grahn for writing the best VRML browser and for support on VRML questions. And last not least thanks to Robert G Stein for supplying the music" for the project.